The 16th century was Safed's Golden Age. Many of the great rabbis of the era lived, studied and taught in Tzfat. During this time Tzfat became known as the City of Kabbalah due to the large influx of Kabbalists who made their home in the town. Rabbi Isaac Luria, the ARI 1532-1572 Next to R' Shimon Bar Yochai, the author of the Zohar (basis of Kabbalah), the ARI is the most revered Kabbalistic Rabbi to have lived. His family originated in Egypt, and although he himself was born in Jerusalem, upon the death of his father, the family returned to Egypt. He was raised in an uncle's house and became known throughout the Jewish world at an early age as a mystic of mythical stature. In 1569 he came to Tzfat where he studied and taught, though he never wrote anything down. He located gravesites of many great Talmudic Rabbis and other scholars who had died hundreds of years before his time. He prophasized, divined, explained the unexplainable, and directed Kabbalah study to the direction that we know it today -- as a way of understanding the secrets of the Torah and how knowledge of those secrets can help us strengthen our relationship to God and to our fellow man. 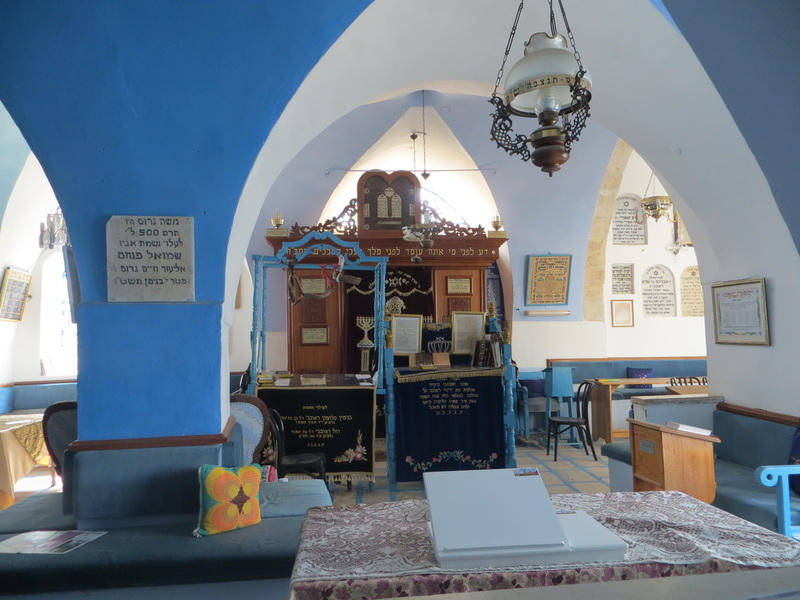 To this day, visitors to Tzfat can see the little room in the Ari Sepharadi synagogue where The ARI is said to have studied with Elijah the Prophet, and broadened his understanding of Kabbalah through Divine Inspiration. Rabbi Joseph Caro 1488-1575 Born in Turkey to a family which had been expelled from Spain, R' Caro labored for 30 years in writing the Beit Yosef, his compilation of the laws of Jewish life which guide, till today, Jews throughout the world in their daily lives. R' Caro worried that after the Spanish Expulsion, the new far-flung Jewish communities would no longer be able to have easy access to the Laws, and so he shortened his Beit Yosef to The Shulhan Aruch to help laymen in their day-to-day practice of Torah life. R' Caro is said to have written his works in a basement room which sits below today's Yosef Caro synagogue with the aid of a maggid, a heavenly messenger whose advice and assistance followed him through his years of scholarly research, writings, and then as the Chief Rabbi of Tzfat. R' Caro is one of the very few scholars who wrote and studied conventional Torah law while relating to Jewish mysticism, the Kabbalah, in fathoming the mysteries that lay behind the written words of the Torah. Rabbi Ya'akov Beirav 1474-1546 Rabbi Beirav arrived in Tzfat from Damascus, intending to develop Tzfat's cultural and economic base. He was responsible for the mills which were built in Wadi Limon which resulted in the expansion of the wool dying trade in the area. As a wealthy merchant, he was able to establish a yeshiva in Tzfat and give stipends to the students and their families. However, it was as Chief Rabbi of Tzfat that R' Beirav became famous, because he envisioned the resumption of the Sanhedrin in Tzfat. R' Beirav was concerned over the fate of Marrano Jews who openly converted to Christianity in Spain and Portugal, but continued to secretly practice Judaism. When some of those Marranos escaped and began to attempt to return openly to Judaism, many Jewish leaders scorned their return, and refused to allow them to rejoin the Jewish community. R' Beirav wanted a body with the authority of the Sanhedrin, a Jewish court which functioned during the time of the Temples and was outlawed by the Romans, to be reinstated, so that the authority of the Rabbis who demanded that these returnees be accepted back to Judaism would not be questioned. The objection to reinstating the Sanhedrin was so strong outside of Tzfat that, although Beirav ordained 4 of his students (R' Caro, R' Di Curiel, R' Di Trani, and R' Shalom), their power was never recognized. But the Rabbis themselves, both individually and now, collectively, carried enough authority to be able to influence the Jewish world to accept their way of thinking, and the Marranos began to assimilate back into the Jewish world. Rabbi Shlomo Alkabetz 1505-1584 R' Alkabetz is best known as a student of the ARI and R' Joseph Caro, a mystic, and a poet whose practice of going out to "bring in the Sabbath" while watching the sunset over Mt. Meron inspired him to write the "Lecha Dodi" prayer which Jews sing during the Kabbalat Shabbat Service throughout the world. R' Alkabetz is also one of the originators of the custom, together with R' Yosef Caro, of staying up all night on the Shavouth holiday to study Torah. Rabbi Moshe Alshekh d.1594 R' Alshech was ordained by R' Yosef Caro. He sat on the Beit Din of Tzfat and founded a synagogue for Marranos who wished to return to Jewish practices. Rabbi Chaim Vital 1542 - 1620 R' Vital was ordained by R' Moshe Alshekh. R' Vital, who had been born in Tzfat, was one of the closest students of the ARI. While the ARI never wrote down his teachings, R' Vital did, but promised the ARI that he would not share them because of a worry that such strong mysticism could, if widely known, cause havoc with people's lives and the world. Legend states that these writings were stolen from R' Vital and dispersed...it is these writings which form much of present-day Kabbalah study.